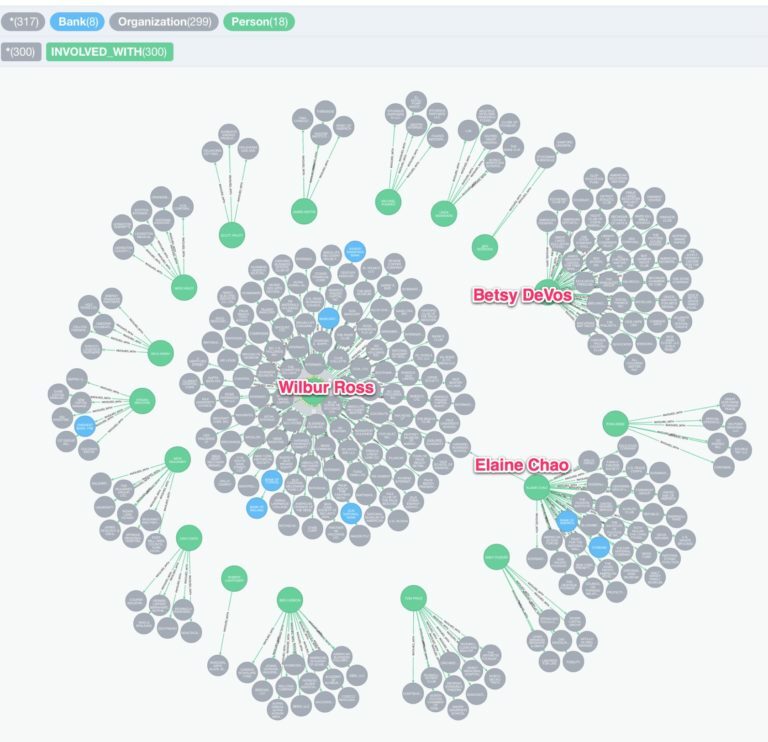 Using Neo4j, you can pick apart the TrumpWorld dataset to help better understand the connection. This seriously interesting read will help make data mining great again! I came across this tweet by Sanchez Castro, which I am more than happy to support. Now we are asking the public to use our data to find connections we may have missed, and to give us context we don’t currently understand. We hope you will help us — and the public — learn more about TrumpWorld and how this unprecedented array of businesses might affect public policy. 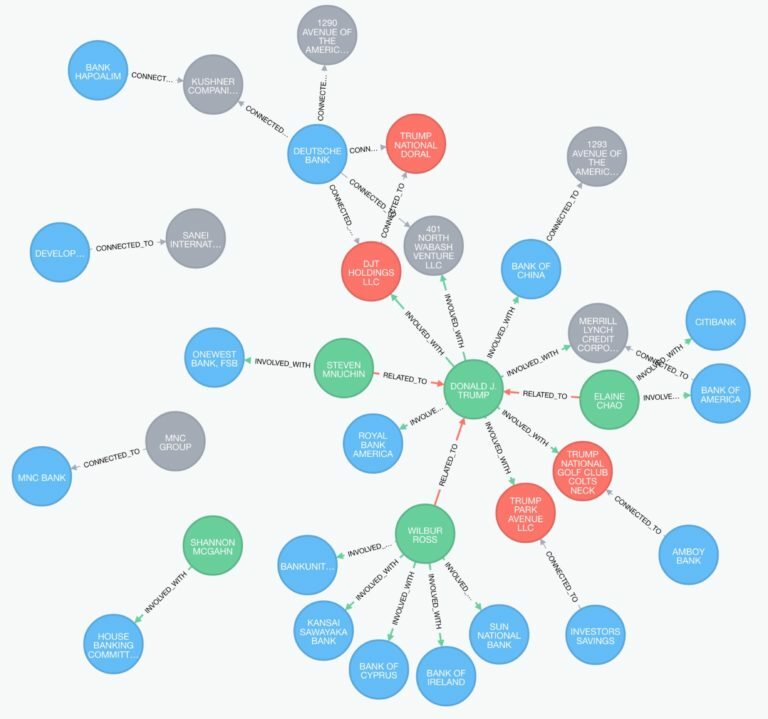 As you probably know, Neo4j has been used in investigative journalism before. Most notably in the collaborative work of the International Consortium of Investigative Journalists (ICIJ) on the Panama Papers investigations, but also by other investigative organizations and journalists. To support this kind of work, we launched the Data Journalism Accelerator Program last year to help investigative data journalists better leverage graph database technology. So, this below is our small contribution toward mapping and analyzing the first part of the TrumpWorld dataset. Much more connected data analysis is possible, which I’ll outline at the end of the article. The Buzzfeed article points to a Google Spreadsheet with collected, verified and researched data of the connections of organizations and people related to Trump with each group listed on a separate tab. The data is, fortunately, available as a publicly readable document, so we can use our old trick of downloading it as CSV/TSV and using the download URL with LOAD CSV to import the dataset into Neo4j. If you want to, download and start Neo4j (it only takes a minute). 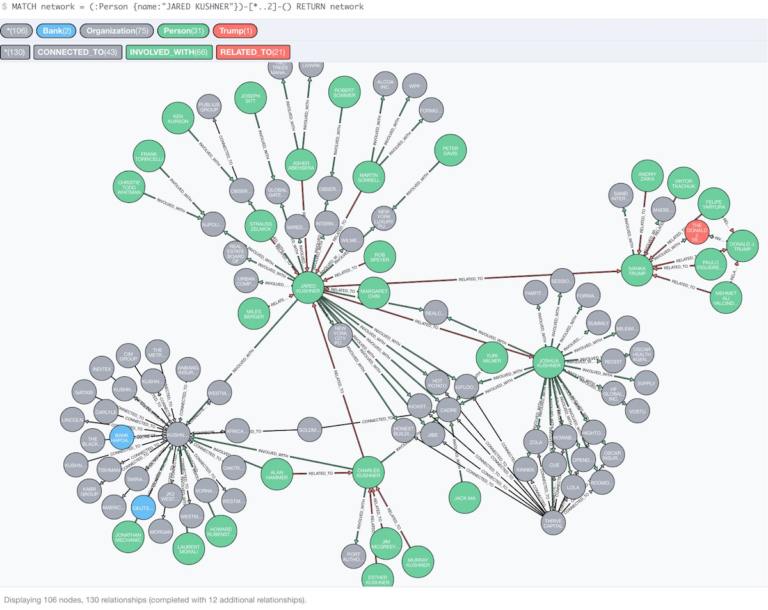 Then you can run these queries in your local Neo4j instance, or have a look at the interactive variant of this post as a Graph Gist (our data science notebooks for graphs). All example queries in this blog post use the Cypher graph query language. 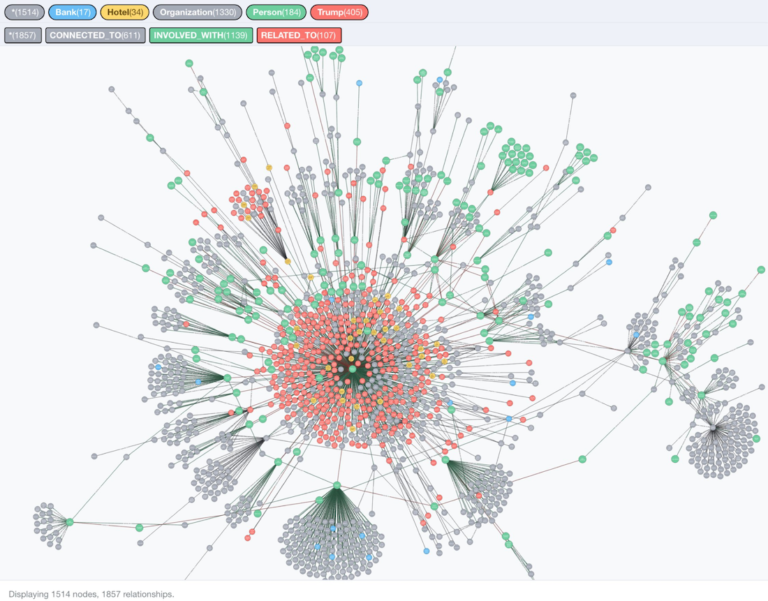 You can see that it’s quite straightforward: two columns for the node-entities (i.e., organizations), one each for the type of connection, along with the source of the information which represent the relationships. As the connection information is quite verbose and not regular enough to serve as relationship-type, we either have to simplify it, as is demonstrated in this more detailed TrumpWorld graph. We store the “connection” and “source” information on each relationship. So, in total, we imported 1,514 nodes and 1,857 relationships. And this is the full TrumpWorld graph in all its “beauty,” after querying for all data (raise the view limits in the sidebar config), go to fullscreen and then zoom out. What are the organizations that have the most connections within the TrumpWorld dataset, and which are those mainly? Which Banks Are Involved With These Organizations and People? And finally, let’s look at the shortest paths between Vladimir Putin and Donald Trump. As expected, the shortest path between Putin and Trump officially goes through Rex Tillerson. But as you can also see, there is a missing direct connection between Trump and Tillerson, the current nominee for U.S. Secretary of State. As we’ll see next, the other nominees are there, so this is one bit of missing information that I reported back to Buzzfeed. You see that Rex Tillerson should be the second in this list, sorted reverse by last name. We see that these 18 individuals are involved with 299 organizations that they either work with, own or control, are indebted to or are otherwise involved with Donald Trump. To conclude, I want to demonstrate what graph databases are quite good at – quickly finding transitive relationships within data. First, I looked for the longest shortest paths in our graph, checking a cross product of roughly 17,000 pairs of people. This finished in little over three seconds on my laptop. If we pick two of those – Lev Leviev and Roma Downey – who have probably little to do with each other in real life except her wearing diamonds, we can see who connects them in our graph. Combine with related data from littlesis.org, "the involuntary registry of the 1%"
Add FEC campaign financing information. Add foundation detail data from citizenaudit.org. Add people involved with the election campaign. Add second-degree organizations related to the other people in the graph, not just Donald J. Trump. Add more detailed information on the organizations and their setup (location, leadership, deals), e.g. by querying APIs like OpenCorporates or by integrating with the data from Aleph the OCCRP data portal. Our partner Linkurious was inspired by the first part of my work to demonstrate how you'd visualize this data with their software. Published at DZone with permission of Michael Hunger , DZone MVB. See the original article here.